When I switched from bottled water to my own re-usable bottles, I was sure it would be a huge hassle. I was sure I’d forget to refill them, forget to take them along, lose them… In fact, it hasn’t been nearly so dramatic. 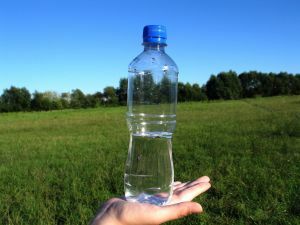 It’s a very easy habit to maintain, I’ve relatively infrequently been caught waterless, and I haven’t lost a bottle yet. This entry was posted in Industry Issues, Water and tagged bottled water, Flow movie on February 15, 2011 by local delicious. Okay, let’s be realistic. Not everyone is willing to give up the convenience of bottled water. If I forget to take water with me or am overcome with sudden thirst, I sometimes give in and buy it myself. And, not everyone takes the health concerns seriously or thinks their contribution of plastic amounts to much in the grander scheme of things. Instead of trying to drag consumers kicking and screaming toward more earth-friendly practices, what if we came up with other solutions that make it easy for even the least health- or environmentally-conscious among us to drink more responsibly? Like Craig Zucker did. 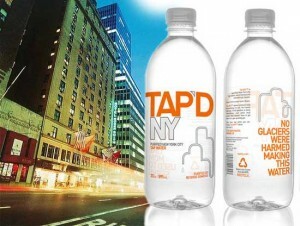 Zucker came up with Tap’D NY: filtered, local tap water from New York, sold in New York. Since most bottled water is just unfiltered tap water anyway, and a number of brands are shipped half way around the world for North American consumption, it makes more than a whole lot of sense. So here’s a crazy idea: What if our city partnered with a truly local bottling company to create a profitable business that pumped money back into the municipal budget for things like upgrades to our water infrastructure? Wow, that’d be a novel, forward-thinking idea, wouldn’t it? This entry was posted in Industry Issues, Water and tagged bottled water, TAP'DNY on November 8, 2010 by local delicious. It’s sometimes hard to distinguish which issues are strictly local, though. I mean, The Environment is a heck of a huge issue, and global in scope. But it does have local ramifications, obviously. So it is with the issue of water. I got raked over the coals recently for having a case of bottled water in my trunk. Now here’s the confession: I’m just a regular Joan/Joe like most you. Though I’m issues-conscious and try to be generally well-informed, I am decidedly not a strict adherent to any movement. I don’t always do everything I “should” be doing to reduce my emissions (sounds a little crude, doesn’t it? ), reduce my footprint, recycle/reuse, and always chose the environmentally sustainable option. Heck, I don’t even always eat local. So there you have it: I’m a bit of a skeptic about jumping on any band wagons, but I do believe in individual responsibility and making an effort. So when I got taken to task by a decidedly non-environmentally concerned citizen, I knew he had a point. In truth, I’ve often felt guilty about all those plastic bottles even though I frequently use them more than once and always leave them beside the dumpster so they are sure to be picked up and taken to the recycling depot. It was especially guilt-inducing when I’d have 3 or 4 empties rolling around together on the floor of the car, taunting me. I’d often thought about alternatives to keeping bottled water in the trunk, so the pointed barb hit it’s mark. I mean, bottled water isn’t anything more than tap water and it’s often filled with more harmful junk than our local tap water is. So, what was the issue? Laziness? Inertia? The need for yet more planning ahead in an already chaotic daily schedule? Well, I’m happy to report that the case of bottled water is now gone from my trunk, replaced with 3 non-BPA containers that I rotate. One is with me up front, two are in the trunk in case I run out. The bottled water was always about convenience, but I’ve discovered that the new system is pretty darn convenient and less hassle than I’d imagined. With the three on rotation, I’ve yet to run out. Hah! One giant step for me, one small step for the earth. This entry was posted in General, Industry Issues, Water and tagged bottled water, polluted drinking water, Water on May 24, 2009 by local delicious. While at dinner with a friend a few years ago, I was amused when the waiter offered me a choice of either “bottled water” or “Vancouver Tap”. It was a higher end restaurant and I thought this was a great way to describe the less exciting option. It wasn’t just tap water – it was a much sexier, well-branded “Vancouver Tap”. Perhaps the ultimate in consuming local food and beverages, tap water is beginning a return to vogue. With the realization that bottled water leaves behind, well, bottles (3 million in Vancouver area landfills last year alone), many environmental groups and, indeed, Metro Vancouver itself, are lobbying residents to take another look at “Vancouver Tap”. In fact, Metro Vancouver has a current goal to reduce bottled water use by 20% by 2010 by encouraging residents to refill reusable water bottles with tap water. Further to the environmental affects, the cost of bottles vs. tap is staggering. 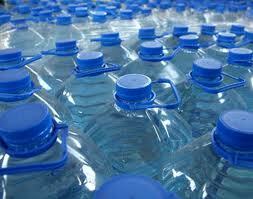 Bottled water costs $1-2 per litre while tap water in Metro Vancouver costs a mere $0.80 per 1,000 litres. If you’re concerned about the chlorine taste in the water (used to disinfect the water from both the Capilano and Seymour reservoirs), water filtration systems such as Brita can help. So, next time you need to quench that thirst, reach for “Vancouver Tap”: it’s cheap, safe, and leaves no bottle behind. This entry was posted in Industry Issues, Water and tagged bottled water, tap water, Vancouver on April 5, 2009 by candrina.